Currently based in Lyttelton, a small port town on the east coast of New Zealand’s South Island, Luke works as a freelance graphic designer, lecturer, and musician. Luke graduated from University of Canterbury’s School of Fine Arts (NZ) in 1997, and completed a Masters in Design at RMIT (Melbourne) in 2006. An interest in practitioner-oriented writing and independent publishing evolved from his postgraduate research, motivating and informing the foundation of The National Grid project. Luke is co-editor of The National Grid with Jonty Valentine. Under various pseudonyms Luke spends too much time playing guitar in local surf band The Damned Evangelist. 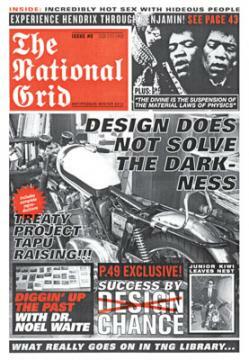 Not quite 'magazine' and not quite 'academic journal', The National Grid defined its own vision of graphic design .